Golden Gate Highlands National Park is secretly tucked away in the rolling foothills of the Maluti Mountains and surrounded by breathtaking scenery of wildlife and lush vegetation. 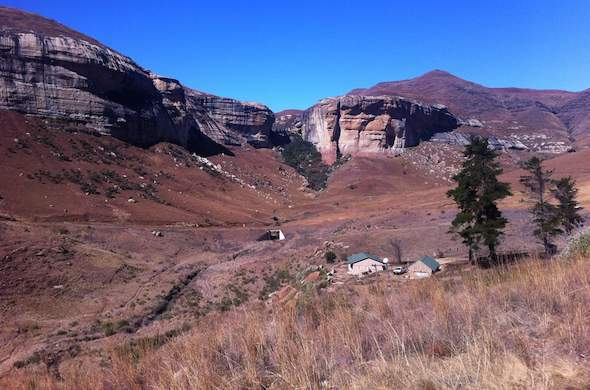 Highlights: Bushmen Paintings and rare flora, as well as the threatened Oribi. The Golden Gate National Park is a Free State Nature Reserve in South Africa, located in the north eastern part of Free State and derives its name from the brilliant shades of gold cast by the sun on the sandstone cliffs, especially the imposing Brandwag rock. The area is famous for its captivating scenery, invigorating climate and the accommodation offered in hotel rooms, rondavels (round huts) and self-catering chalets. The park is a real highlight for visitors to the Free State. Popular attractions include the vast, colourful sandstone formations, which shine golden-yellow in the evening sun, and from which the area derives its name. Vegetation in the Golden Gate Nature Reserve consists mainly of wooded ravines, gullies and grasslands. Golden Gate Highlands National Park was established in 1963 to protect the sandstone rocks were once shelters for the Bushmen. Guests can view many of their cave paintings that are well preserved. The park also boasts various rare and indigenous flowers that include the Arum Lily, Watsonias, Fire Lilies and Red-Hot Pokers. This Free State Nature Reserve in South Africa is one of the last refuges of the rare Bearded Vulture and the rare bald ibis which breeds annually in Cathedral Cave. The park is also home to a variety of mammals that include Burchell's Zebra, Black Wildebeest, Eland, Blesbok, Springbok and the threatened Oribi. Some 140 bird species have been identified in the park, and a hide at the Vulture Restaurant enables bird lovers to view these creatures closely.